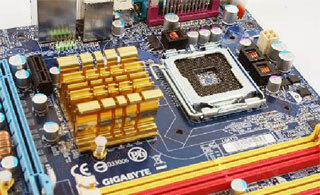 Why does GIGABYTE use solid capacitors for their Ultra Durable line of motherboards? Is there really that much difference between solid capacitors and electrolytic capacitors? One of the most noticeable things about a GIGABYTE Ultra Durable motherboard is that every capacitor used is a cutting-edge Conductive Polymer Aluminum Solid Capacitor from the world's leading vendors. Visually, it is easy to see the difference. The motherboard on the left was designed using all solid capacitors, while the motherboard on the right uses the more common and less expensive electrolytic capacitors. Solid capacitors and electrolytic capacitors both store electricity and discharge it when needed. The difference, however, is that solid capacitors contain a solid organic polymer, while electrolytic capacitors use a common liquid electrolyte, hence, the terms solid capacitor versus electrolytic capacitors. So how does this actually effect the capacitor's performance? In terms of lifespan, solid capacitors last longer than electrolytic capacitors, especially at lower working temperatures. As the table below shows, as the temperature decreases, the lifespan for solid capacitors increases. At 65◦C, the average lifespan for a solid capacitor is more than six times greater than electrolytic capacitors. In actual years, the solid capacitor will last approximately 23 years, while the electrolytic capacitor dies after only three years. Granted, most people will replace their motherboard long before 23 years, but clearly, solid capacitors have a lifetime advantage over electrolytic capacitors. Solid capacitors have a higher tolerance not only for higher temperatures, but they also perform better with higher frequencies and higher current than electrolytic capacitors. First, let's try to understand the higher tolerance for high frequencies. In order to do this, we must first understand a little bit about Impedance. Impedance is a measure of the overall opposition of a circuit to current and is measured in ohms (Ω). A better way to phrase this might be to say that impedance is how much the circuit (in this case the capacitor) impedes the flow of current. The less the flow of current is impeded, the better. Less impedance also means less heat is generated. 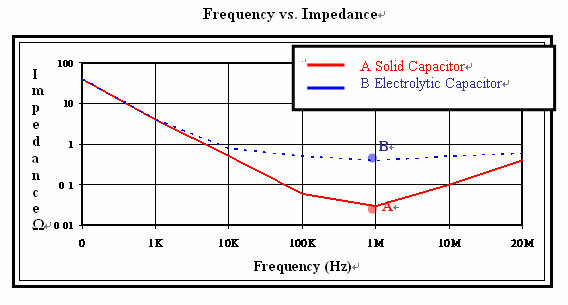 The chart above shows that solid capacitors are able to deliver substantially lower impedance at higher frequencies. Because there is less impedance at higher frequencies, solid capacitors are more stable and generate less heat than electrolytic capacitors. Solid capacitors also deliver more stable capacitance and are less likely to be affected by temperature changes. 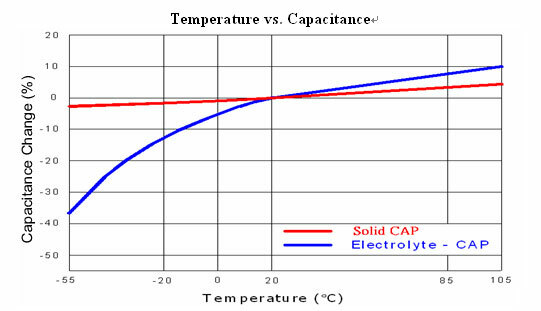 As the chart below shows, even at extreme temperatures, solid capacitors have relatively stable capacitance, especially when compared to electrolytic capacitors. By being able to tolerate higher frequencies and higher temperatures, solid capacitors not only last longer, but they also deliver increased stability and performance over electrolytic capacitors. A few years ago, some people started experiencing problems with their electrolytic capacitors on their motherboards. Users began noticing bulging, or swelling of the capacitors, and in some cases, the capacitors were even leaking fluid. Obviously, this dramatically lowered their system's performance, and in several cases, damaged the motherboard to the point where it no longer operated. 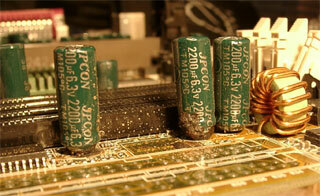 There has been a lot of speculation as to what actually caused these capacitors to fail. One theory was that the electrolytic solution used by some manufacturers for a number of capacitors was faulty. That aside, even the highest quality electrolytic capacitors can fail. Take for example an "always on" system in an internet café. The strain put on the capacitors in terms of constant, prolonged usage, as well as high system temperatures can easily lead to capacitor failure. Remember, an electrolytic capacitor running at 85◦C has an average lifespan of just 8,000 hours, which is less than one year. 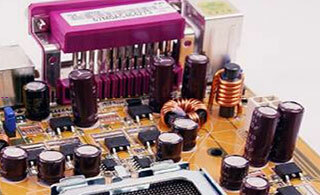 As there is no liquid component to solid capacitors, they don't experience leaking or exploding. In addition, their ability to tolerate extreme conditions and their overall robustness, make them much more suited to extreme stress operation. GIGABYTE offers a wide range of Ultra Durable motherboards built tough enough to satisfy even the most hard-core PC gamers. Designed entirely using all solid capacitors, GIGABYTE Ultra Durable motherboards are guaranteed to deliver maximum stability, reliability and longer system lifetime for the ultimate PC gaming and entertainment experience. Generating less heat then their electrolyte counterparts, solid capacitors last on average 6 times longer, helping to ensure your system never quits. Additionally, solid capacitors have a higher tolerance not only for higher temperatures, but they also perform better with higher frequencies and higher current than electrolytic capacitors. The excellent heat resistance and better electric conductivity allows enthusiasts to tweak the highest levels of performance from their system without fear of excessive capacitor wear or exploding capacitors. Adopting an all solid capacitor design helps explain why GIGABYTE Ultra Durable motherboards are the most stable, reliable and most overclocking-friendly motherboards on the market today. All intellectual property rights, including without limitation to copyright and trademark of this work and its derivative works are the property of, or are licensed to, GIGABYTE TECHNOLOGY CO., LTD. Any unauthorized use is strictly prohibited.